Fixed rate home loans are a popular choice, but what are your chances of picking the right time to fix? Is fixed or floating best for your home loan? There is always a great deal of debate in the media around fixed versus floating home loans. So Canstar’s analysts have crunched the numbers on fixed rate loans and floating rate loans to determine when home buyers should have chosen a fixed home loan – or a floating rate home loan – to save money over the past 10 years. Of course, you’ll still have to make your own decision about whether going with fixed or floating on your mortgage rates will be the best choice for your budget. You can read about some of the pros and cons of fixed vs. floating here. 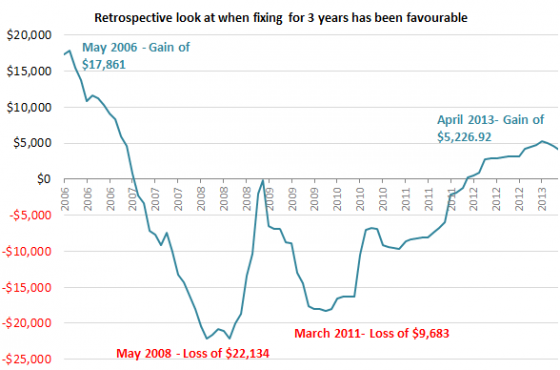 In the meantime, here are the cold, hard facts about fixed rate home loans over the past decade. Since 2006, the pendulum has swung back and forth between whether fixed or floating home loans saved the home buyer money – and the degree of that pendulum swing depends on whether you chose a 1, 2 or 3 year fixed rate. Let’s have a look at those options in more detail. The chart below shows when, over the past 10 years, home buyers have done better by fixing their home loan for a 1-year term versus sticking with the floating rate. Where the results are above the centre line, home buyers who fixed in these years made a good choice; where the results are below the line, buyers who fixed in those months really should have stayed with the floating alternative. The calculations are based on the monthly average standard floating rate and the average fixed home loan rates for a 1-year term on Canstar’s database. 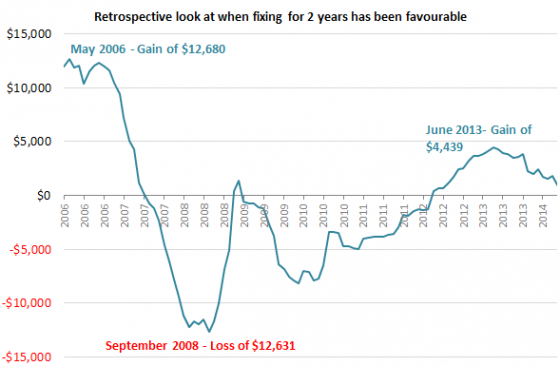 As you can see above, picking a 1-year fixed rate home loan has generally been a rewarding choice for home buyers, apart from the big dip in 2008 (during the GFC) and rough patches in 2010 and 2011. In October 2010, home buyers could save $6,787 in interest, while those who fixed for 1 year in December 2013 would have saved $2,952 in interest. The chart below shows when, over the past 10 years, home buyers have done better by fixing their home loan for a 2-year term versus sticking with the floating rate. Where the results are above the centre line, home buyers who fixed in these years made a good choice; where the results are below the line, buyers who fixed in those months really should have stayed with the floating alternative. The calculations are based on the monthly average standard floating rate and the average fixed home loan rates for a 2-year term on Canstar’s database. Based on the monthly average standard floating rate and the average fixed home loan rates for a 2-year term on CANSTAR’s database. 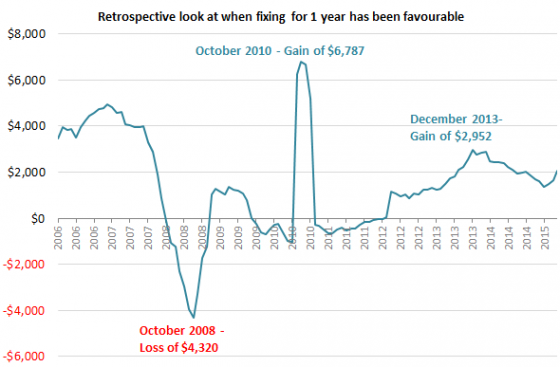 As you can see above, a 2-year fixed rate home loan has been quite a rocky ride for borrowers, with fixing for 2 years only saving the home buyer money in 2006 to early 2007, and 2012-2014. The average home buyer who fixed for 2 years in June 2013 would have saved $4,439 in interest. The chart below shows when, over the past 10 years, home buyers have done better by fixing their home loan for a 3-year term versus sticking with the floating rate. Where the results are above the centre line, home buyers who fixed in these years made a good choice; where the results are below the line, buyers who fixed in those months really should have stayed with the floating alternative. The calculations are based on the monthly average standard floating rate and the average fixed home loan rates for a 3-year term on Canstar’s database. Based on the monthly average standard floating rate and the average fixed home loan rates for a 3-year term on CANSTAR’s database. Choosing a 3-year fixed rate home loan was likewise a bold but generally unrewarding move. Those who fixed in 2006 to early 2007 and those who fixed in 2012 and 2013 saved money on their home loans – but for everyone else, fixing in other years was a decision they would have regretted. Some home buyers would have lost out on as much as $22,134 by paying too much in interest on their loan! Should you fix your home loan now? With our official cash rate currently sitting at 2.25% and the Reserve Bank still expecting a poor global growth outlook and a weak domestic economy, there’s been a lot of talk over whether home loan interest rates could go lower still. If you fix your home loan now, your rate will stay at the same fixed rate for the fixed rate period regardless of whether rates do go down further or not, so you may end up paying more interest than you need to. Meanwhile, if you had a floating rate and the Reserve Bank reduced the cash rate again, the bank may pass on that reduction in interest rates to your loan. Rates are current as at 6 June 2016. As of February this year, the split in mortgages across the country sees 23.5% on a floating rate and 76.5% on a fixed rate. What fixed home loan rates are on offer? Remember that conditions and potentially fees will apply, and that you should look at the comparison rate of products on your shortlist as well as the current advertised rates.